Key takeaways from Dreamforce 2018! Dreamforce is a haven for Salesforce professionals, with everyone from Admins to Architects flocking to San Francisco each year for the technology’s flagship event. This year saw some particularly exciting announcements, with new products and strategic partnerships set to enhance the already robust Salesforce product suite. Earlier this year, Salesforce acquired integration specialist Mulesoft, which was predicted to improve the way customer data is available across different standalone Salesforce products. This potential is now being explored with Salesforce’s new Customer 360 platform, which offers businesses a click-based admin interface that allows them to identify customers across multiple channels. With Customer 360, it doesn’t matter how the customer is identified; whether you’re given their full name, mobile number or twitter handle, Salesforce will match the data with records stored across your products, and bring up a full profile of the customer to help inform your decision making. There will be pre-built packages available for Service, Commerce, and Marketing Cloud, making it easy to get started out of the box. One of the greatest benefits of using a cloud CRM is accessing data across multiple devices, and this functionality is set to become even more streamlined on the Salesforce platform. With this new strategic partnership with Apple, Salesforce is being granted access to the power of Siri, and the ability to build and deploy iOS apps on the Lightning platform. Salesforce users are being promised a brand new Salesforce mobile app on iOS, as well as a Trailhead mobile app, so you can continue your personal development whether you’re sat on the sofa, on the bus, or anywhere else with access to mobile internet. As well as a Salesforce Mobile SDK, which will be optimized for Swift (Apple’s programming language), there will also be new developer Trails added to help you get started with App Development on iOS. According to Mason Frank’s 2018/19 independent Salesforce salary survey, 92% of Salesforce professionals utilize the Salesforce mobile app, so clearly, there is a demand for a highly functional Salesforce application on iOS. After all, why wouldn’t you want to stay in tune with your company’s sales, marketing, and customer service opportunities while on the go? As we move closer towards full automation, it is predicted that voice technology will revolutionize the way we search for and share information. The stumbling block that many technology vendors face however is that while voice technology is available, they don’t have their own super-intelligent AI platform to process and harness the resultant data. Salesforce doesn’t have this problem, as Einstein is already one of the more powerful AI modules in existence, and is set to become all the more impressive. Einstein Voice Assistant allows users to build branded voice bots for their company, creating custom voice commands for immediate customer solutions. So whether the consumer is using Alexa, Google Assistant or Siri, you can now begin taking advantage of voice search to identify new customers on the Salesforce platform. Learn how to begin utilizing Einstein Voice Assistant by taking the Einstein Trail. Salesforce is already benefitting from its strategic partnership with AWS, with services such as Heroku, Quip, and Marketing Cloud Social Studio running on AWS infrastructure, but this expanded partnership will now make it simple for users to publish and subscribe to Salesforce Platform Events in AWS. The expanded partnership will also benefit users of Service Cloud, who can now build AI-driven self-service voice experiences through integration with Amazon Connect—this means Salesforce is now Alexa-friendly. If you want to get started, the Amazon Connect CTI Adapter is now available on the AppExchange. While we hope you’ve learned a lot from reading our highlights of Dreamforce 2018, it’s definitely worth watching the keynote for your focus product, and you can do that at the official Salesforce YouTube channel. They contain product demonstrations that you may find particularly useful and also highlight how other Salesforce professionals are using the technology to connect with customers. Have any highlights of your own? Let us know in the comments below. –> Thank you so much, Amy Gallagher (From Frank Group) for your input. 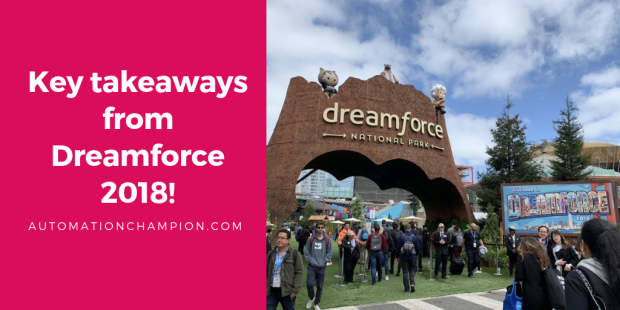 ← To be a Champion – Meet Automation Champion – at Dreamforce 2018! Good article, but love to read a full detail article on things introduced in Dreamforce. Thanks for your feedback, Kamal. You can find the Dreamforce Videos on YouTube.